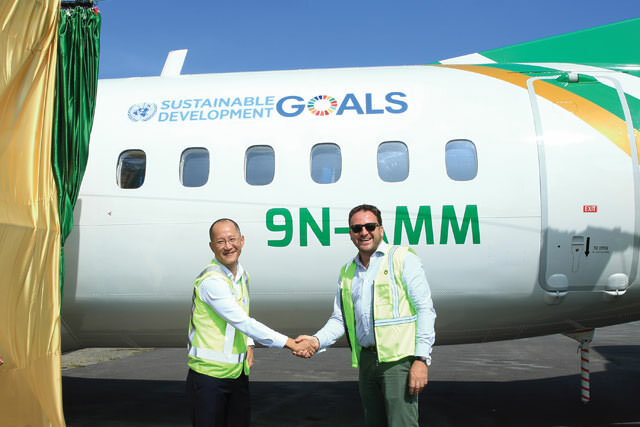 CLIMATE FRIENDLY: Yeti Airlines CEO Umesh Rai and UNDP Nepal Representative Renaud Meyer unveiling the SDG livery on the airline’s new ATR 72 recently. The aircraft will allow Yeti to reduce its carbon emission by 15%. Yeti Airlines has become the first operator in Nepal to perform an energy audit and plan mitigation efforts to reduce its carbon footprint. An fuel inventory of the company’s eight aircraft fleet, its 27 vehicles and offices around the country showed that the company generated just over 18,000 tons of CO2 equivalent last year. Yeti now hopes to increase efficiency by replacing its ageing with BAe Jetstream 41s with more modern ATR 72 500s, work with the civil aviation authorities to streamline air routes as well as offset its carbon use. “As an airline we burn a lot of aviation gasoline, but there are ways to reduce emissions by being more fuel efficient and other measures that will not just make us climate friendly but will also save on costs,” says Yeti Airlines CEO Umesh Chandra Rai. Yeti has been working with the United Nations Development Programme (UNDP) in Nepal to spread awareness about its Sustainable Development Goals (SDG) through decals on its aircraft, airside ramp buses, boarding passes and on other stationery. UNDP has been signing up the private sector to propagate its SDGs throughout the world and this week signed a similar carbon reduction agreement with China’s Hainan Airlines. Yeti’s carbon footprint increased in 2017, but with the induction of two ATR 72 500s which are 15% more fuel efficient, it hopes to reduce its CO2 per passenger by up to 11% this year. The airline hopes phase out all its Jetsream 41s in the next five years. 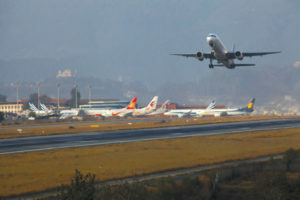 Rai says he hopes other domestic airlines will also join in improving efficiency, and work with the Civil Aviation Authority of Nepal (CAAN) to reduce long holding times for aircraft due to congestion at Kathmandu airport. Other measures include pilots reducing the rate of climb, and to using the entire length of runway for landings and takeoffs. Cutting back long holding patterns would save more aviation fuel and reduce carbon emissions than fuel efficiency, and CAAN is being urged to move smaller domestic aircraft to a new STOL airfield outside Kathmandu. CAAN Director General Sanjiv Gautam says after the much-delayed airport upgrade is finished by 2019, aircraft movements will be smoother. A new radar system that goes into operation this week will also reduce separation between aircraft and reduce holding times.